I wore the multi coloured JQ glitter first, because there seemed to be the most interest in this one. 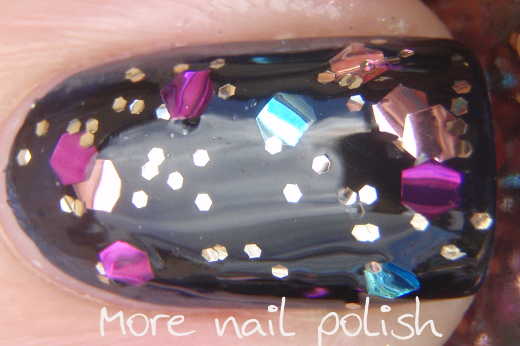 This was one coat of Ulta3 midnight, one coat of JQ glitter polish and one coat Seche Vite. There are a few rough patches, but it certainly isn't annoying nor does it make you pick at it like a kid with a week old scab (ewh!). The suspension polish forms a nice glossy layer over the polish, but you still must wear a top coat to get it feeling smoother. These polishes are smelly, and with no ingredients on them I would guess that they are not three free. This one, has hex shaped glitter in it, large blue, pink and fuschia pieces and small silver ones. Its really hard to take full sun shots of a glitter because of the light flares of the glitter particles. The above photo is in the shade, below in the sun. Super up close. Because these hex glitters are very thin, you can see how they actually curve, sometimes they curve downwards, other times upward. Where possible I tried to get mine curving downward because it gave for a much smoother finish. I wore this over black for the day, then I was browsing the web last night and saw swatches of Deborah Lippmann's 'Glitter in the Air'. I thought it looked kinda similar, so I took off my mani and applied it over a light colour. Here I have two coats of Ulta3 Allure and one coat of of JQ multi coloured glitter. I really like this combination too. It's not as in your face as over a dark color. Unlike Glitter in the Air, the glitter pieces in this are super shiny and very reflective. The Glitter in the Air ones look kinda dull, maybe because of the milky base? The coverage of the glitter in this also seems much better. Although the glitter particles did stick together a little bit, I was easily able to separate them with the brush on the nail. My verdict so far with these JQ glitters is, AWE - wait for it - SOME! I'm really looking forward to trying the other polishes with different colour combinations. 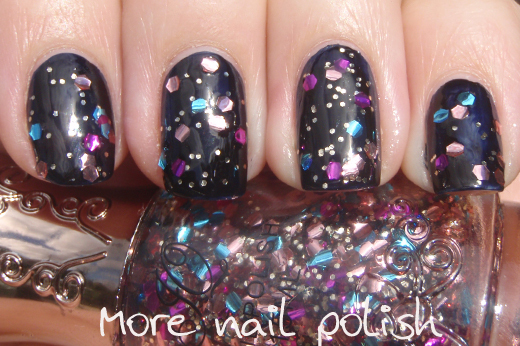 I really like the hex glitter polishes... very pretty! The ebay seller was blueheart123. But if you search 'varnich' (that spelling) you will find them come up in the first page. How fun! They look like a funky polkadot rather then how I imagined. I would have loved it to be a dense glitter coverage. Mmmmmm sparkles. Lianne - I think you could get much better glitter coverage if you did more than one coat. Ah~~~ I like the effect on the Allure. You made me extend my 'to-buy-list' again!!!! I've always gone for denser coverage but I love this sparse effect - it looks like a party going on! Funny how your habits can change when you see someone else doing something different. ;( they don't ship to the U.S. I'm so sad! 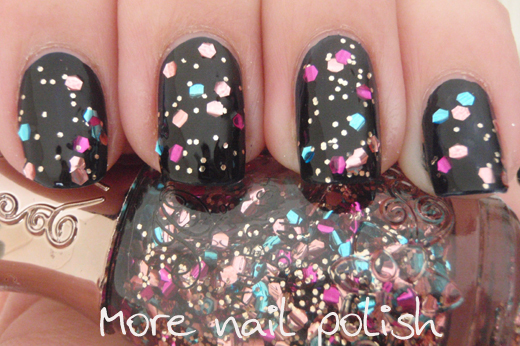 That is such a pretty polish! *squeeel* i have this lol, have been waiting to do a post on my blog too lol, it looks lovely here !! Aaaa I love it! 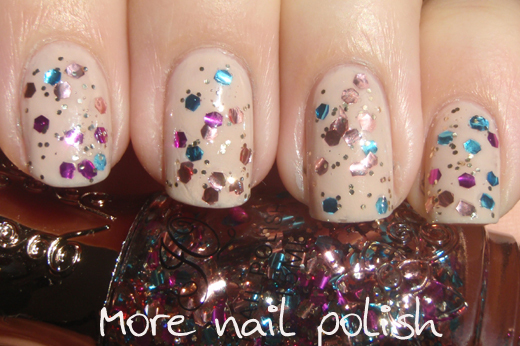 This would make a great polish for the "glitter under" look! I like the big glitters. They won't "get lost" on your nail.